During this Advent season, I am listening to Facebook. What, exactly, does this mean? Each year during Lent, I shut down my Facebook accounts. But during Advent, I keep them open and view their content without posting, replying to or “liking” anything. During Advent, I simply log in and listen. Today, as we light the third candle on the Advent wreath, I am taking time to reflect on the effect that this practice of "logging in and listening" has had on my life. During Advent last year, I read about what was going on in the world of my friends and family and found it annoying to be unable to let them know I saw their posts. In fact, I would email or text people to let them know that I had seen what they had posted, but that I couldn’t reply because of my Advent practice of not replying. “But,” some would ask, “Isn’t texting or emailing defeating the purpose of the practice?” Of course it is! But I am always a work in progress! However, this year is different. This year I have not only not replied outside of Facebook, but my online practice of listening has also spilled over to other aspects of my life. I find myself making the effort to listen to my Sisters, friends and family in order to hear what they are actually saying rather than attempting to formulate a quick reply or suggest a potential outcome based on something I only half-heard. While I have not perfected my listening skills (and probably never will), this practice has made a world of difference for me this Advent. So, what made this year different from last year? In a word, mercy! 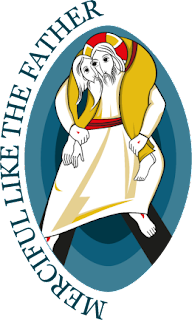 Since October, I have been sharing reflections and giving retreats about mercy in anticipation of the Jubilee of Mercy that opened on December 8. My preparation for these events has been steeped in Scripture, Pope Francis, Walter Kasper and Pauline von Mallinckrodt. I have reflected deeply on the Parable of the Lost (or “Prodigal”) Son and his merciful father (Luke 15:11-32). I have delved into Misericordia Vultus, the letter of Pope Francis introducing the Jubilee of Mercy. I have read Walter Kasper’s Mercy: The Essence of the Gospel and the Key to Christian Life. 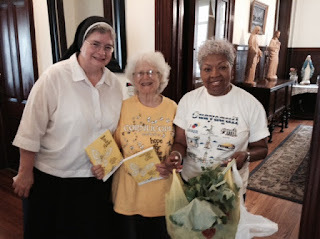 I have pondered the extensive writings and letters of Blessed Pauline, the founder of the Sisters of Christian Charity. Indeed, I have been drinking deeply from the well of mercy – and it has made a difference. What have I learned and (hopefully) shared as a result? 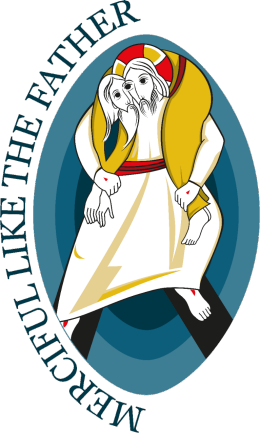 · From Luke 15: Be merciful like the father: When someone has done something worthy of punishment, mercy makes it possible for both the wrongdoer and the wronged to retain their human dignity. · From Pope Francis (via Pope John XXIII): In all situations attempt to apply the medicine of mercy rather than the medicine of severity. While my "Facebook learnings" do not seem to figure into any of these “mercy learnings,” they are, indeed, related: Only when we first suspend our need to reply quickly or to offer swift solutions can we then begin to respond to others from a place of mercy. 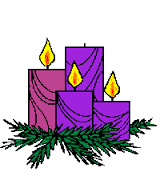 Dear friends of the Passaic Neighborhood Center for Women: As we prepare the way of the Lord for the remainder of Advent 2015, let us "log in" to our lives in a way that is steeped in listening deeply and responding mercifully. Thank you for all you are and all you do for and with us! As you know, all proceeds from our Christmas Boutique on November 10 went to the quilters who made the items. These women used the money from the sale to purchase their own, brand new sewing machines. The excitement today was palpable as the machines were delivered. Look at the smiles on their faces in these photos as Sr. Pat Reynolds, SC shows them some of the 50 stitches that are possible with their new machines! We are grateful to all our benefactors and staff who made this a reality for our women. You are most likely aware of Black Friday, Small Business Saturday and Cyber Monday. For the past four years, Giving Tuesday has been added to the list. According to its website, Giving Tuesday is "a global day of giving fueled by the power of social media and collaboration. Observed on the Tuesday following Thanksgiving (in the U.S.) . . . Giving Tuesday kicks off the charitable season, when many focus on their holiday and end-of-year giving." Volunteers: Would you like to teach introductory English (no teaching experience necessary) or teach crocheting or sit with children two hours a week while their mothers take classes? Financial Donation: Donations can be made on the blog (click here, then click on the "Donate" button on the right) or by sending a check payable to "Passaic Neighborhood Center for Women" to the Center at 153 Washington Place, Passaic, NJ 07055. Gift cards: At the Center, we can always use gift cards from Staples to buy office supplies. Our women are always in need of food, so Shop Rite gift cards (in increments of $25 or less) are welcome. Photocopier and copy paper: Currently, we use "All-in-One" printers for our photocopying needs. We would welcome a photocopier that can copy more efficiently than these. Also, we are in need of reams of white copy paper. Diapers and wipes: From time to time, a mother has to make a choice between food and diapers for her child. At these times, we try to help with diapers and wipes. The most-used diaper sizes are 3 and 5. If you can help with any of these requests -- whether on "Giving Tuesday" or during the rest of the year, please contact Sister Ann Marie at the Center -- (973) 470-0844 or sam@patersondiocese.org. Thank you and God bless you for your generosity in considering these requests. Thank you to reporter, Cecile San Agustin, editor Rich Sokerka, and everyone at The Beacon (newspaper of the Diocese of Paterson, NJ) for their coverage of our Christmas Boutique. Click here to be directed to the Digital Edition. The article is on page 5. On this Thanksgiving 2015, we are grateful for the support of Bishop Serratelli and everyone in the Diocese of Paterson. We are grateful to the religious communities whose spirit of collaboration and prayerful, material and human resources enable us to open our doors each day. 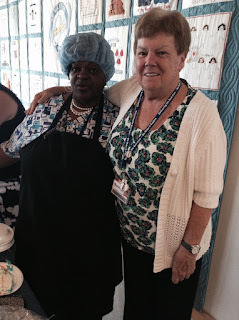 We are grateful to our staff, whose untiring love of the women of Passaic bears fruit each day. We are grateful for the women who continue to meet, share and grow at the Passaic Neighborhood Center for Women. Thank you and God bless you! Happy Thanksgiving! The 34th annual Thanksgiving service sponsored by the Passaic Ecumenical Committee will be held at 3:30 p.m., Sunday, Nov. 22 at St. Mary’s Assumption Church, 63 Monroe St. (corner Market and Monroe Streets) in Passaic. The homilist will be Sister of Christian Charity Ann Marie Paul, director of the Passaic Neighborhood Center for Women. Mayor Alex Blanco of Passaic will be present and will extend the greetings of the Passaic community to those attending. The theme of the service is “Blessed are the merciful” relating to the Year of Mercy proclaimed by Pope Francis to extend from Dec. 8, to Nov. 22, 2016. The ecumenical choir comprised of members of the Passaic churches will lead the congregation in song. All those who attend are asked to bring an offering of non-perishable food items to be distributed to the needy of the Passaic area. Refreshments will be served at a social in the Church Hall after the service All are invited to attend. She would like that this post is being written about her. In fact, she would be thrilled! From the day we opened our doors in September 2013, she had been one of the most enthusiastic women to visit the Center. Her sense of style -- it would be an understatement to call it "unique" -- pervaded her creations in art class. Her searches on the Internet -- that is, once she learned how to search the Internet -- were driven by her seemingly unquenchable thirst for knowledge. Her proudest moments at the Center were spent in the garden. Growing the vegetables that she used to feed her family made her so happy. She watered the garden every day, sometimes twice a day during the hottest days of the summer. During the first year of our garden, she pointed out repeatedly that the garden was too small and that each woman should have her own garden bed. When we did this in the second year, she claimed to have been singlehandedly repsonsible for it, and that was fine with us. Her favorite vegetable to grow was kale, because she heard it was one of the healthiest vegetables to eat. To be sure that she was growing and harvesting it properly she watched video after video on YouTube, shouting out her new learning to anyone who would listen. Speaking of shouting: If she was walking up State St., riding on a bus near the Center, or talking to someone else nearby she would make sure to get our attention when she saw one of us. "I'm on my way to water the garden!" "I'll be over in a minute to use the computer." "Did you see that kale?" "Do you think those tomatoes are ready to pick?" "Can you help me find directions on Mapquest?" She "had been through a lot" in her life, she said. That made her tenacious in just about every way. She would not accept answers to questions unless she understood every bit of the explanation. She was the epitome of a "life-long learner." 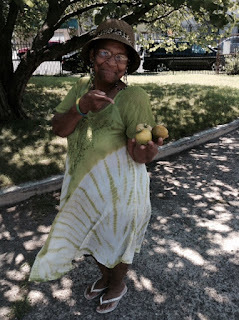 She loved life and was especially attuned to those people society tends to ignore, especially the elderly. She couldn't attend morning classes because of her work at the Senior Center. She was frequently requested as a home health aide to the elderly. She would have been 58 years old today. Had she been at the Center, we would have sung to her with lit candles on cupcakes. She would have asked for extra cupcakes to take home to her sons or to neighbors who rarely got cupcakes. Instead, today we mourn her loss, secure in the knowledge that heaven will soon abound in different varieties of kale. If God argues that it's taking up too much room, God will lose the argument (and possibly be forced to drink a kale smoothie). Rest in peace, dear friend! Thanks for keeping us on our toes. We love you and we will miss you greatly. 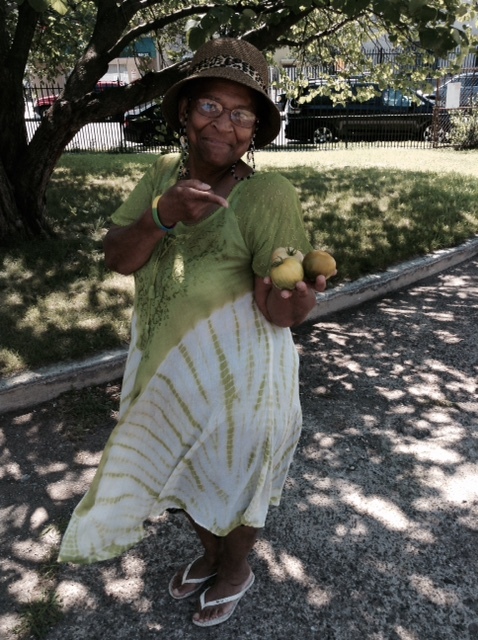 The Passaic Neighborhood Center for Women is a better place because you graced it with your presence. Still searching for the perfect Christmas gift? If you were unable to come to the Christmas Boutique on Tuesday or if you came and wish you would have picked up one more item, you are in luck! We have a few table runners (for $40) and bottle covers (for $10) remaining. See the photos below for a sampling. If you'd like to buy any of these or if you have a question about our remaining inventory, contact Sister Ann Marie (sam@patersondiocese.org or (973) 470-0844). As always, thank you for your support! Thank you to our outstanding benefactors! 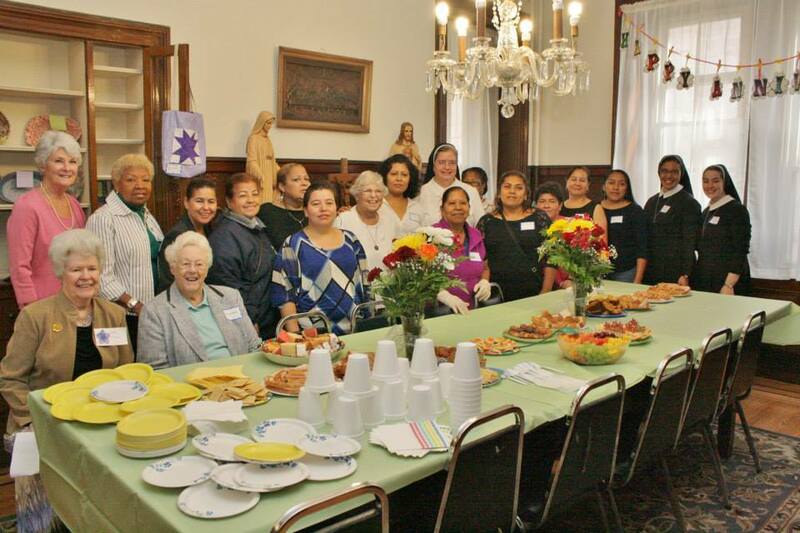 The Passaic Neighborhood Center for Women continues to serve the women of Passaic largely because of the generosity of our benefactors. On Tuesday at our first-ever Christmas Boutique and Art Show, our benefactors came through again. Thank you to everyone who came and who bought our women's beautiful handmade items. We are so very grateful to Sisters of Charity Patricia Reynolds (Quilting) and Mary Culhane (Art) for their loving guidance and instruction of our women. Here are some photos of the day. Beautiful table runners and quilts were sold on Tuesday. Bottle covers and other small items were also popular. Nancy admires the quilt made by Elizabeth. Reminder: Christmas Boutique in One Week! We hope you are planning to join us next Tuesday, November 10, for our first-ever Christmas boutique between 11 am and 1 pm. Our quilters have many handmade holiday items available for (cash only) purchase. Click here to be reminded of the details and to view the flyer for the event. 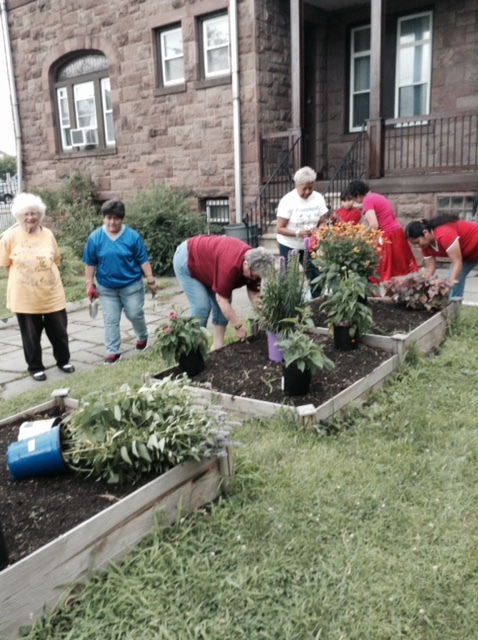 Believe it or not, today is the second anniversary of the Passaic Neighborhood Center for Women! 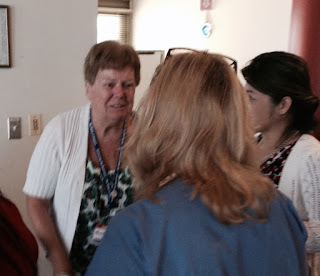 Since September 24, 2013, we have seen more than 2,500 visits from our women. At moments like these, we are at a loss for words, so we will just say -- again and again -- THANK YOU! To our bishop and diocesan staff, to our collaborating religious communities, to our staff and volunteers, to our benefactors, especially Partners in Faith donors, to our neighborhood pastors and parishioners and to the women who make themselves at home at the Center -- THANK YOU, THANK YOU, THANK YOU! As we celebrate our second anniversary, we look back on last year's first anniversary celebration. Reminder: SAVE THE DATE: On Tuesday, November 10 from 11 am until 1 pm, our quilters will be selling their homemade Christmas and other holiday items. They are working feverishly to complete their work and it's beautiful. Hope that you can make it! 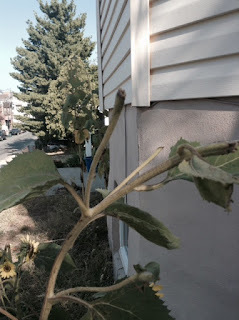 Indeed, what you see in the photo is a strong sunflower stem with the flowers missing, having been eaten by the squirrels. How do we know that the squirrels were the culprits? 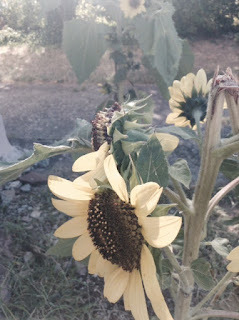 Because every time we rounded the corner of the house, the stems of the sunflowers were bent over due to the weight of the animals whose faces were buried deep in the center of the flower. Seeing us, the squirrels would scurry off to await our departure, so they could return to their task. As a result, we decided to let the squirrels win this one. "If they want the sunflowers, let them have them," we thought, "We'll make them squirrel-proof next year." 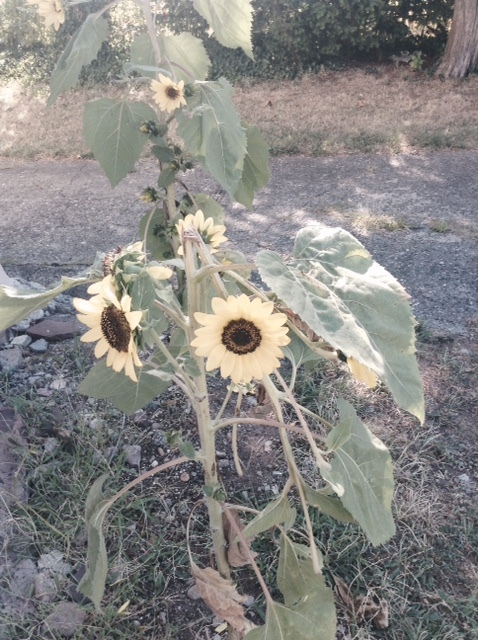 So, we stopped caring for the sunflowers -- no water, no weeding, no watchful eyes. The squirrels finished their looting of the sunflower garden and we moved on, considering how next year's planting would be different. End of story . . . or so you would think. When robbed of their flowers and the uppermost parts of their stems, the flowers continued to grow -- without extra water or care. In fact, the removal of their largest flowers seems to have given the plants' smaller flowers a chance to grow faster and more abundantly. Further, the flowers are just high enough off the ground and their branches are just delicate enough that the squirrels are unable to attack -- although it doesn't stop them from trying. So, instead of a well-tended garden that appears ridiculously barren of flowers, we have a seemingly untended garden of abundant sunflowers. God is the master gardener. We are not God. Forgetting this causes much unnecessary stress. As much as we fussed over the flowers during the consistently hot days this summer, we did not cause the flowers to grow; we merely facilitated their growth by being good stewards. God's results exceed human expectations. We cannot begin to fathom the mercy of God, who will not be outdone in generosity. 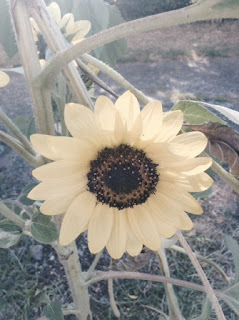 Although we judged the squirrel attacks as a threat to the survival of the sunflowers, they were actually an opportunity for the flowers to thrive. God never ceases caring for us. We are human beings who have limitations that cause us to "throw in the towel," at least once in a while. God is not. 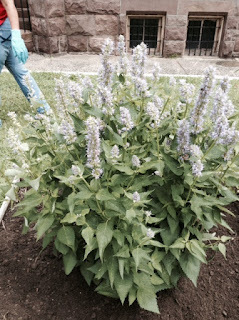 While we were ready to give up on the flowers and use our mistakes as a learning experience for next year's growing season, God was not finished -- and the results were beautiful! Today, most sunflowers in our region are giving way to the flowers of autumn. While we look forward to the beauty of autumnal hues, we cannot forget the lessons that the sunflowers -- and, yes, even the squirrels -- of 2015 taught us. As long as we remain open to these lessons, the results will be beautiful! 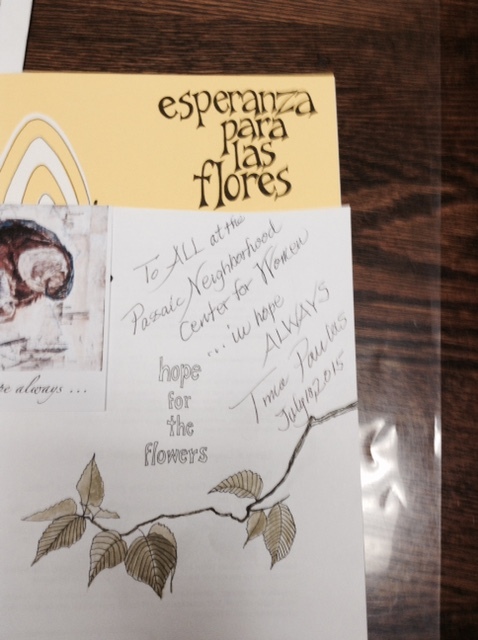 The Center in "New Dimensions"
Thank you, Sisters of Charity, for including the Passaic Neighborhood Center for Women in the latest issue of your publication, New Dimensions. The Center is included in this publication because we have again received a Sister of Charity Ministry Grant. 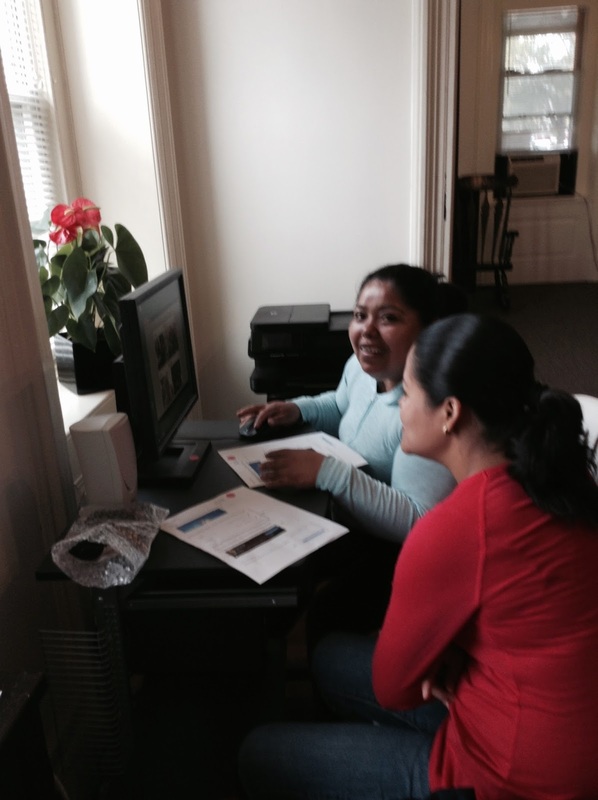 This year's grant allows us to purchase software to enhance the opportunities for our women to learn English. Click here to read the article (on page 7). 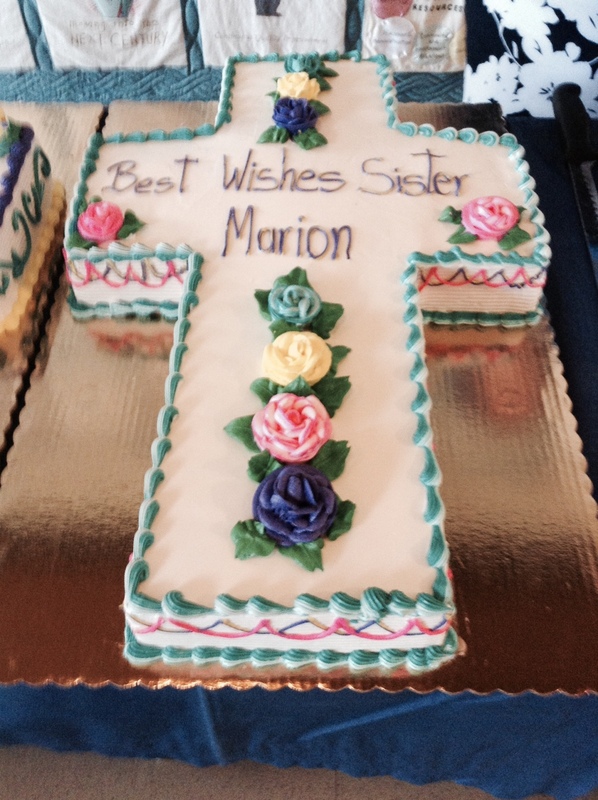 Sister of Charity Marion Scranton, Vice-President of Mission Effectiveness at St. Mary's General Hospital, Passaic, retired on Tuesday after more than 20 years of service to the people of Passaic. Certainly, we wish her well. But more than that, we offer her our heartfelt gratitude for the part she has played in the successes of the Passaic Neighborhood Center for Women during the past three years. 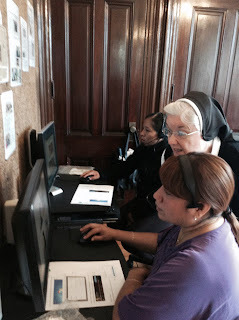 (Yes, the Center has only been open for two years, but Sister Marion's involvement predates the Center's opening.) In 2012, when the sub-committee of religious superiors was looking for a site for the Center, it was Sister Marion who suggested the former rectory of St. Nicholas parish, our current location. Once a director was on site, Sister Marion collaborated and networked ceaselessly on the Center's behalf and referred many women to the Center. She made the resources of the Community Health Education Department fully available to the Center, which has benefited from the tireless help of Sister Anne Moroney, SC, Director, and Luz Flores, Outreach Assistant. At a ceremony on Tuesday, Edward Condit, St. Mary's CEO, extended gratitude to Sister Marion for her years of service. 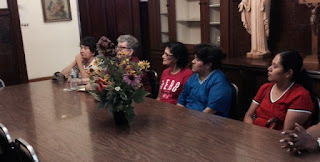 Additionally, many St. Mary's co-workers testified to the difference Sister Marion has made in their lives, the lives of their families and to the "life" of the organization. 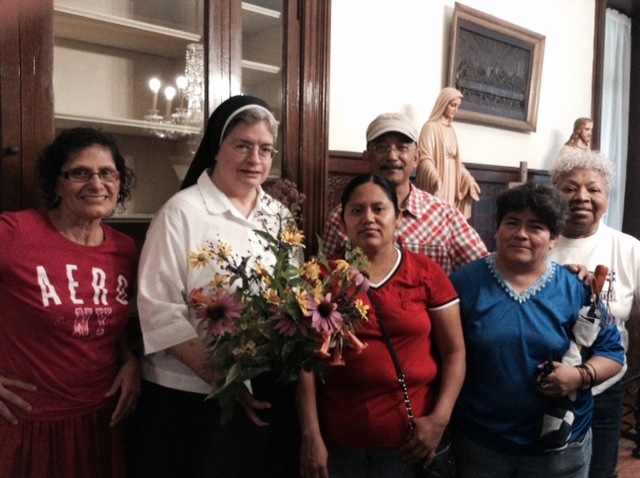 While Sister Marion has promised to remain in touch with those of us in Passaic, we will miss her daily presence. We offer her our heartfelt gratitude and prayers. God bless you and your future endeavors, Sister Marion! 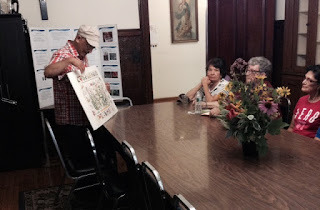 Once again, we had a very good workshop presented by Jose German, of Green Harmony Now, LLC, Sustainable Eco-Friendly Gardening and Landscaping and arranged by Claudia of City Green. Let's allow the photos and captions to tell the story. 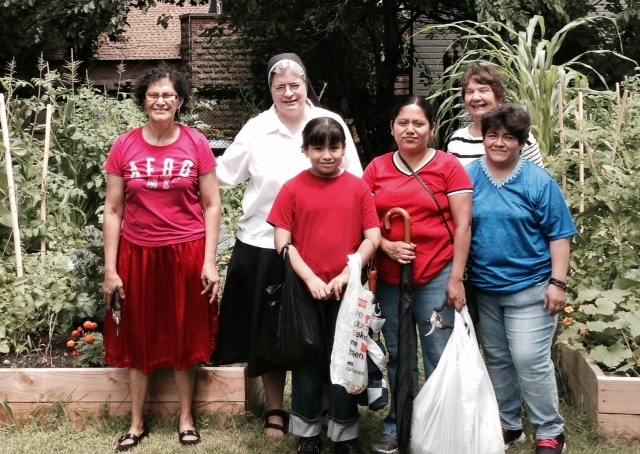 We are grateful to Jose, Claudia, all our gardeners, our Associate Director, Sister Elaine and our garden coordinator, Ann Marie, for making this day possible. Our presenter, Master Gardener Jose German, shares tips on composting. Everyone listens attentively to Jose's bilingual presentation. Jose presented the Center with an arrangement of native flowers. Coral Bells, Black-eyed Susans, Echinacea and others. Our youngest gardener presents Sr. Ann Marie with one of the fruits of the harvest. What a surprise we had at the garden workshop on Saturday! Jose German, our workshop presenter, brought his friend, Trina Paulus, with him. Those of us who have been around a while (OK, for more than a while) might recognize Trina as the author and illustrator of Hope for the Flowers. Originally written in 1972, Hope is described as "a tale -- partly about life, partly about revolution and lots about hope for adults and others (including caterpillars who can read)." It is alternately described as "a different sort of book for everyone except those who have given up completely (and even they might secretly enjoy it)." 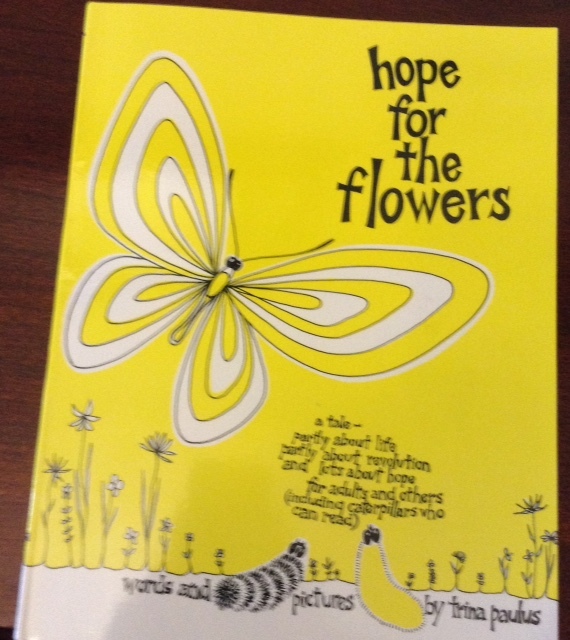 If Hope for the Flowers is new to you, read it! We won't spoil it for you by telling you the story here. Suffice it to say that you will enjoy the adventures of "Stripe" and "Yellow" as countless others have in the 40+ years since Hope was first published. Before you run out to the bookstore to purchase your copy (or while you're waiting for its delivery after your online order), enjoy these photos of Trina and the books she so graciously donated to the Passaic Neighborhood Center for Women -- one in English, one in Spanish, both autographed by the author! Director of the Center, and Ana, one of the Center's faithful gardeners. 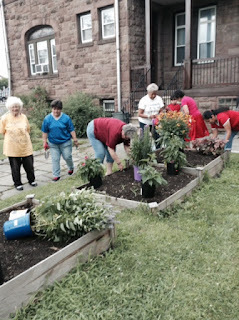 We had a great garden workshop on Saturday, focusing on native flowers. We are grateful to Claudia and Jose for the time, effort and energy they brought (and always bring) to the Passaic Neighborhood Center for Women. This workshop will be the subject of several of our blog posts this week. Stay tuned! In the meantime, many of you have asked the same question. The answer is, "Yes, the weeds are gone." The "before" and "after" images are below. So, what happens when the weeds, virtuous as they are, give way? Beauty of another kind! Reflect: Right now, do I need the beauty of the weeds, growing wild where they are, knowing no boundaries, and being watered only by the rain? Or do I need the structure, care, and watering that the newly-planted flowers require? Indeed, both are beautiful. But we must choose the beauty we need right now -- that is, the beauty God wants to share with us right now -- and gratefully pray toward the acceptance and nurturing of that beauty. Choose your beauty: The weeds . . .
. . . or the flowers? 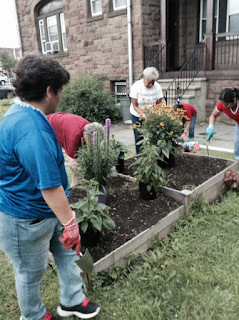 According to Ralph Waldo Emerson a weed is “a plant whose virtues have not yet been discovered.” If Emerson were to look at the back yard of the Passaic Neighborhood Center for Women today, he would see the potential for the discovery of much virtue. In our “old” raised garden beds from last year, in which we have not yet planted flowers, there are weeds of all sizes and shapes. These weeds popped up during the last few weeks when there has been the right combination of sunshine and rain. 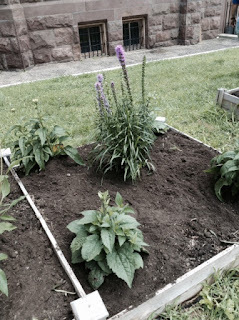 As the weeds began to appear, I thought, “We’ll have to get rid of them before our July 18 workshop when we’re planting flowers in these beds.” As they grew larger, I thought, “I don’t have the time and energy to deal with these weeds.” Recently, I thought, "I'll tolerate them or pretend they are not there." After all, these weeds do not interfere with our new vegetable garden which was planted on May 15. 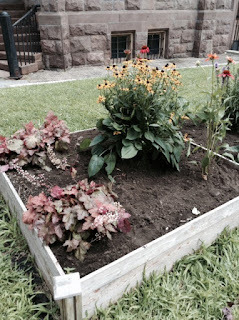 Those ten, newly-constructed, raised beds – safely ensconced on the other side of the church building – are brimming with tomatoes, corn, lettuce, eggplant, kale and other plants. So, why should I pay any attention at all to these weeds? 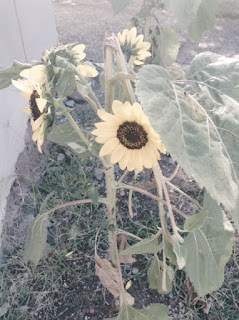 When I finally stopped ignoring and tolerating the weeds, I discovered the grace and beauty of their flowing leaves and upright flowers, swaying in the summer breeze and glistening in the noonday sun (see photo above). When I really paid attention to their grace and beauty, I began to recognize the weeds as beautiful gifts from God. 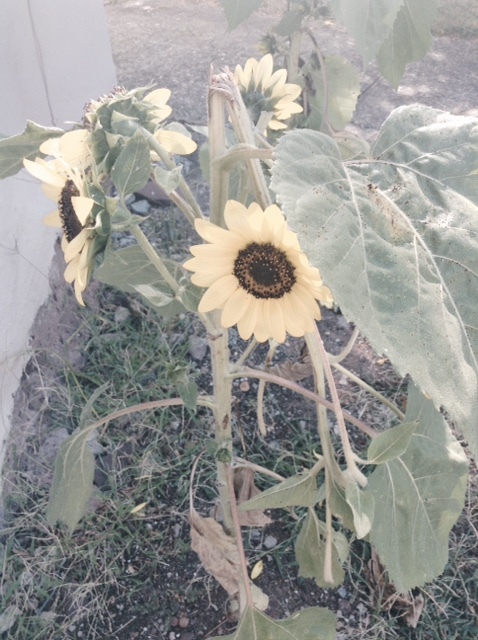 Reflecting on my encounters with these weeds reminds me to pay attention to my encounters with others, especially those whose grace and beauty might not be abundantly apparent to me at first – that is, those whose virtues I have not yet discovered. When I think, "These weeds would be nice if they weren't getting in the way of our planting," or "I don't have the time or energy for these weeds," I am missing an opportunity to encounter them just as they are in their current situation. 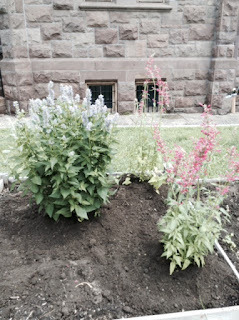 When I walk past these flower beds without a second look, I am missing an encounter with beauty in that particular time and place. However, I am missing out on something much greater when I perceive the people I meet throughout the day as obstacles or energy thieves, or when I walk past someone without greeting them. When I fail to see the beauty of the people I encounter, I tragically fail to recognize some of God's most beautiful gifts -- human beings giving and receiving love. 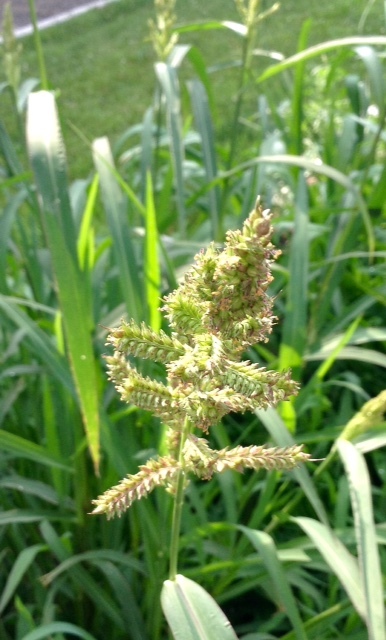 So, what can weeds teach us? That when we lovingly encounter a person just as he or she is right now, it can be grace-filled and beautiful! Rather than seeing someone as a present annoyance or a future obstacle, can we realize that we only have the current encounter with this person? Can we move beyond merely tolerating to encountering -- really encountering -- this person and recognizing him or her as one of God’s many gifts? Can we move toward loving and being loved in whatever situation we find ourselves? If we have difficulties doing this, perhaps we need to spend more time discovering the virtues of weeds!